Schoolhouse Design – Rustic and Farmhouse Styles are Speaking to Us! We are getting closer to starting the interior renovations and I’m thinking about the overall design for the schoolhouse and all the finishing touches. This is the super fun part! But eek, so many decisions to make! Here’s a sneak peek of what we’re working on! 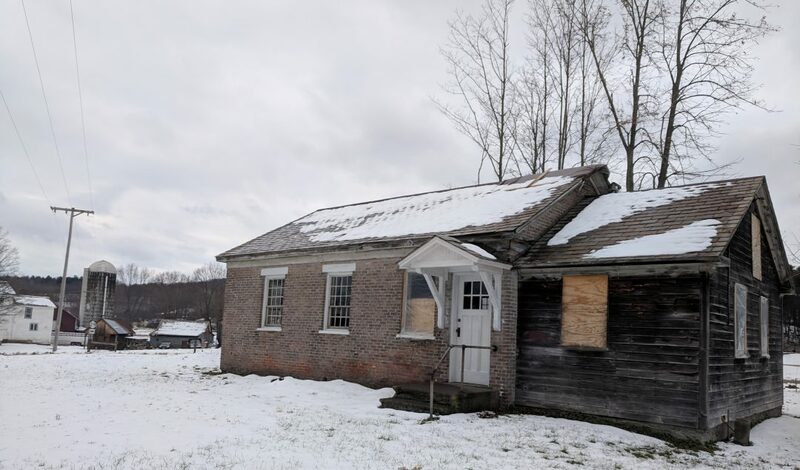 Avid blog readers will know the schoolhouse was built in 1850, but that a significant renovation was done in 1927 to allow the school to stay open. It’s the 1927 renovation that we are going back to in our design. Since the main schoolroom is staying as a 600 square foot open living, dining, and kitchen space, we will have pretty much a blank slate as far as design goes. The main schoolroom including all the trim was yellow with blue base boards. It was a lot of yellow. Right now I’m thinking of changing that yellow to more of a soft white and keeping the trim blue gray. I’ve also been thinking about all those little touches to include in the design. A few gifts that I love that will find a home in the schoolhouse as decor -the little desk below and a few vintage school books. We’ll enlarge and frame some photos of the students, including my grandfather. We want it to feel like a school room without being too heavy handed. Chalk and erasers will be provided so guests can draw on the chalkboards! Love this little desk I got as a Christmas gift These vintage books will look great in the schoolhouse! If you follow my personal facebook page you may have noticed we’ve made several trips to Boston in the last couple of weeks. It gave us the chance to spend lots of time with Auntie Sarah and her bf Colin but the real reason we were there was because the little guy had to have a small surgery. We’re happy to report that we had surgery last Monday and all went well, Philip is on the mend! visiting the New England Aquarium with Auntie Sarah On our way to surgery at 6am We made it home and still smiling! So excited to start hearing more about the upcoming events. Once the weather warms up we’ll be very busy! Love the color ideas, the totally open layout, the windows are gorgeous ( wouldn’tind finding one like yours), the kitchen layout is great( love Jojo). How exciting!!! Yes I love Jojo too, that book is really great…sometimes I’m not so sure about celebrity books but this one is great! I’m so excited to get going on this project. Hopefully we’ll have a couple of exciting announcements soon!